and NEW accessible classical music at popular prices since 1990!" for "Music for Use. Well Crafted, Accessible and Performance-Ready"
and named 2015 "American Prize Honored Artist." Live performance upate. Click on the line below for our video. COMMEMORATION performed in Times Square July 28, 2018 conducted by Steven Reineke. HEAR IT BEFORE YOU RENT IT: By clicking on the icon you can audition a FULL-LENGTH recording of that work instantly. To get your PASSWORD, send us an E-MAIL with your name and orchestra affiliation. The New York Philharmonic, The Philadelphia Orchestra, The New York Pops, The Philly Pops, Cleveland Pops, The Cincinnati Pops, The Boston Pops, The Louisville Orchestra, Atlanta Symphony, The Cleveland Orchestra, St. Louis Symphony, Dallas Symphony, Houston Symphony, Buffalo Philharmonic, San Francisco Symphony, Los Angeles Philharmonic, The Hollywood Bowl Symphony, The National Symphony, The Pittsburgh Symphony, Milwaukee Symphony, Detroit Symphony, Rochester Philharmonic, Jacksonville Symphony, The Louisville Orchestra, Indianapolis Symphony, San Diego Symphony, Oregon Symphony, West Virginia Symphony, Winston-Salem Symphony, The Nassau Pops, Knoxville Symphony, Columbus (OH) Symphony, Fort Worth Symphony, Hartford Symphony, New Haven Symphony, New Jersey Symphony, Stamford Symphony, Anchorage Symphony, Bangor Symphony, Reno Philharmonic, Hot Spring Music Festival, Napa Valley Symphony, Fresno Philharmonic, Long Beach Symphony, San Jose Symphony, Greeley Philharmonic, Delaware Symphony, Palm Beach Pops, Florida Orchestra, Naples Philharmonic, Florida W Coast Symphony, Brevard Symphony, Boca Pops, Columbus (GA) Symphony Orchestra, Albany (GA) Symphony, Georgia Southern Univ. Orchestra, Augusta Symphony, Dubuque Symphony, Illinois Symphony, Lake Forest Symphony, DuPage Symphony, Elgin Symphony, Bloomington (IN) Pops, Fort Wayne Philharmonic, Northwest Indiana Symphony, Evansville Philharmonic, Terre Haute Symphony, Wichita Symphony, Owensboro Symphony, Shreveport Symphony, Saint Cloud Symphony, Baton Rouge Symphony, Cape Ann Symphony, Cape Symphony (MA), Yakima Symphony, Maryland Symphony, Portland (ME) Symphony, West Shore Symphony, Southwest Michigan Symphony, Flint Symphony, Meridian Symphony, Greensboro Symphony, Charlotte Symphony, New Mexico Symphony, Canton Symphony, Mansfield Symphony, Akron Symphony, Warren Symphony, Altoona Symphony, Westmoreland Symphony, Greenville Symphony, Jackson Symphony, Nashville Symphony, Garland Symphony, North East Texas Symphony, Texarkana Symphony, San Antonio Symphony, Midland-Odessa Symphony, Irving Symphony, San Angelo Symphony, Amarillo Symphony, Riverside County Philharmonic, Lubbock Symphony, McLean Orchestra, Richardson Symphony, Virginia Symphony, Richmond Symphony, Wichita Falls Symphony, Everett Symphony, Tacoma Symphony, Wheeling Symphony, West Hartford Symphony, Las Colinas Symphony, Mid-Atlantic Symphony, Orchestra Iowa, Williamsburg Sinfonia, The Danville Symphony, Maine Pro Musica, LaPorte County Symphony, The Big Spring Symphony, The Las Vegas Philharmonic, The Interlochen Philharmonic, The Ridgefield Symphony, Stockton Symphony, NW Nazarene Univ. 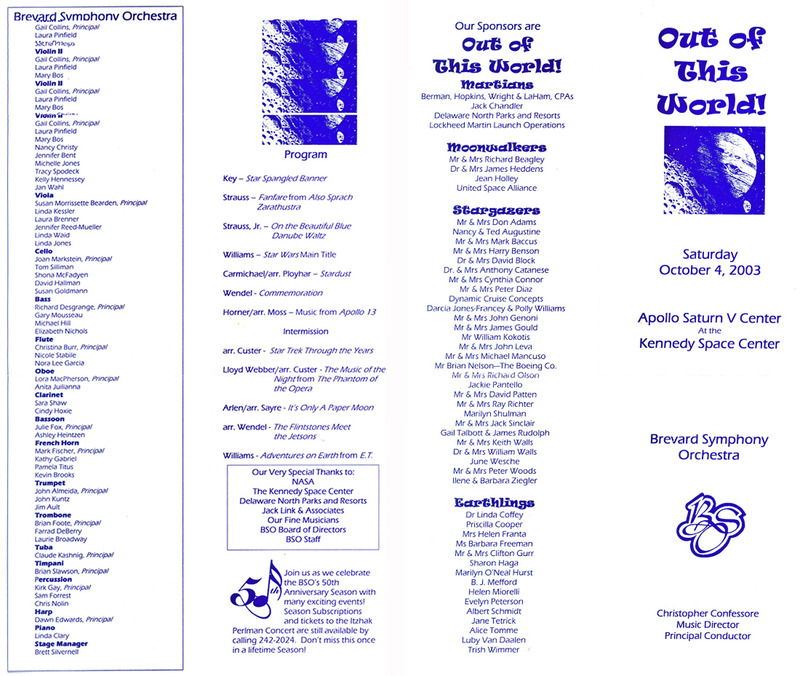 Choir and Orchestra, Worship Orchestra of First Baptist Carrollton, Michigan Philharmonic, Londontowne Symphony, Chicago Youth Symphony, The Salisbury Symphony (NC), Symphony Silicon Valley, Clear Lake Symphony, The Plainfield Pops (IN), The New Britain Symphony and The Chicago Bar Association Symphony Orchestra. The BBC Symphony, The London Philharmonic, and The Royal Liverpool Philharmonic, The Royal Scottish National Orchestra, The Scottish Opera Orchestra, The Ulster Orchestra, RTE National Symphony, (UK), The Brussels Philharmonic (Belgium), The Bochum Symphony, Vogtland Philharmonie, and Landesbühnen Sachsen, Bergische Symphoniker (Germany), Sinfonieorchester Tifico (Switzerland), Orchestre Symphonique Divertimento and Opera de Toulon (France), The Warsaw Philharmonic (Poland), Gavle Symphony and Swedish Radio Symphony AB and the KTHs Akademiska Orchestra (Sweden), Toronto Symphony, The Calgary Philharmonic, The Edmonton Symphony, The Winnipeg Symphony, The Brantford Symphony, National Arts Centre Orchestra, Symphony Nova Scotia, The Victoria Symphony, Niagara Symphony, and Ensemble Euterpe (Canada), Orchestra ICO Magna Grecia (Italy), The Qatar Philharmonic, The Malaysian Philharmonic (Kuala Lampur), The Tasmanian Symphony, Queensland Symphony, The Brisbane Symphony, Melbourne Recital Centre, and The Darwin Symphony, The West Australia Symphony, (Australia), The Auckland Philharmonia (NZ), The Puerto Rico Philharmonic, The Classical/Pops All-Star Orchestra (Barbados), The Cyprus Symphony, The Kyoto Symphony Orchestra, The Nissi Orchestra (South Korea), The Gunma Symphony (Japan), The Singapore Symphony, The Singapore National Youth Symphony, Taipei City Symphony, and The Hong Kong Symphony. Michael Krajewski, David Charles Abell, Steven Reineke, Jung-Ho Pak, John Morris Russell, Stuart Chafetz, George Albert Schramm, Carl Topilow, Christopher Bell, Courtney Lewis, Don Pippin, David Katz, Michael Poulos, Peter Nero, Marvin Hamlisch, and Erich Kunzel. May we add your name to this distinguished list? Prices are for 1 performance only. Extra performances within a 30-day period are pro-rated at +50% for the 2nd performance, and +25% each for the 3rd performance and beyond. A charge will be made for materials lost or not erased (except for bowings). There is a restocking fee of $50 if cancellation notice is received BEFORE contracted performance date. We DO NOT refund for "rain outs." We DO NOT CHARGE EXTRA for longer rental periods. If your orchestra needs more time for rehearsals, that's just fine with us! Sets usually ship with 8/7/6/5/4 strings. Some older sets have 8/8/5/5/5 strings. We prefer payment by check, but you can pay us via PayPal using your credit card. However, if using PayPal, we must add a 3% surcharge to cover PayPal's charges to us. Only in this way can we keep our prices as low as possible for the majority of our clients. Prices include priority mail shipping within the United States. Overnight shipping is available at an extra charge, or on your own FEDEX account. For orders from outside the United States, international shipping and currency conversion charges apply. BMI and ASCAP fees are NOT included and are the responsibility of the performing organization. Payment must accompany your order. - International Orders, recipient is responsible for any tariffs or import duties! Return shipping is the responsibility of the client. For your convenience, orders can be submitted via our online order form which is now available in English, French, German, Spanish, Portuguese, Swedish, and Italian! Most orders received during business hours are processed within 60 minutes or less! Just click here to order. Born in 1951, Robert Wendel studied conducting with Harold Farberman, Brian Priestman, and Michael Charry, and composition and orchestration with Leroy Anderson and Hale Smith. He has guest conducted many of the major symphony orchestras in America including the Pittsburgh, St. Louis, Minnesota, Baltimore, Atlanta, Cincinnati, and Dallas Symphony orchestras, and has toured the US and Europe as conductor for Harry Connick Jr., culminating in the PBS special "Romance From Paris" and concert for the 1998 Nobel Peace Prize in Oslo, Norway. In addition, Robert has been conductor and arranger for Carol Channing, Rita Moreno and other stars, and has written for musical theater, symphony orchestra, PBS-TV, the 1993 Presidential Inauguration and "Cirque de la Symphonie." He created and conducted an entire concert saluting the cartoon music of Hanna-Barbera Productions for the San Bernardino Symphony, and an evening of "Two Centuries of American Music" as the first conductor to take the podium of the New Britain Symphony after the retirement of Jerome Laszloffy, its Music Director of 38 years. His "Fanfare For Freedom" has already become a staple in the symphonic Memorial Day and July 4th repertory, and his arrangements are frequently heard at Cincinnati Pops Concerts and were featured on several of their TV broadcasts. Two of his Christmas arrangements have been recorded by the Cincinnati Pops with Erich Kunzel for Telarc. Robert's "Commemoration," performed at a memorial concert remembering the Challenger Astronauts and played on the Kennedy Space Center launch pad has also been adopted as almost a memorial "anthem" in concerts across the USA after the events of 9-11-2001. It has been recorded on ABC Classics by the Tasmanian Symphony, and was featured live coast-to-coast in the 2006 National Memorial Day Concert on PBS to dedicate the WW II Monument, again on the 2009 concert as part of a tribute to Abraham Lincoln, and yet again in 2011 as part of Gen. Colin Powell's welcoming home of our troops and most recently it was featured on the 2017 concert conducted by Jack Everly to honor the Tuskeegee Airmen and all WWII veterans. As composer, arranger and publisher, he has supplied Pops music to the top 400 orchestras in America, Europe, Canada, Southeast Asia, and Australia, and his work has been featured NBC's "Today" program, and in commercials for QVC and Wal-Mart. He was also called upon as editor, arranger, and orchestrator for numerous Leroy Anderson works, some being recorded for the first time, for the Naxos complete Leroy Anderson Centennial recordings conducted by Leonard Slatkin. Originally from Bridgeport, CT and an alumnus of Fairfield Prep and The University Of Connecticut, Robert now makes his home in New York City. In his spare time, he is a tornado chaser, an amateur astronomer, a telescope maker, and a pyrotechnics afficionado.